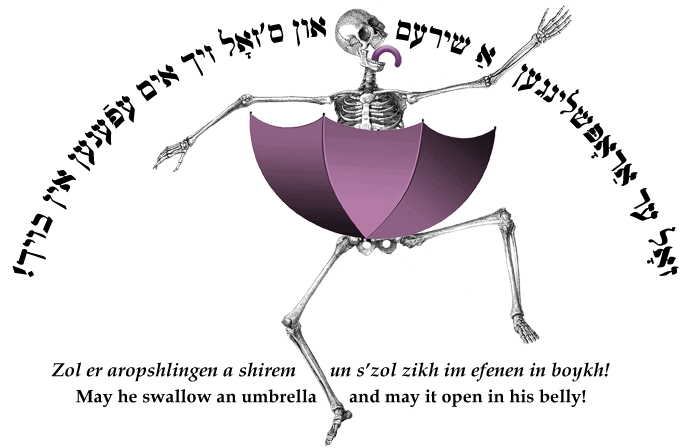 Yiddish Curse: May he swallow an umbrella and may it open in his belly. זאָל ער אַראָפּשלינגען אַ שירעם און ס'זאָל זיך אים עפֿענען אין בויך! Zol er aropshlingen a shirem un s'zol zikh im efenen in boykh! May he swallow an umbrella and may it open in his belly! SOURCE: Harshav, The Meaning of Yiddish. A bizarre example of a מיתה–משונה | mise-meshune | violent, unnatural death (see next saying).